This topic has 28 replies, 24 voices, and was last updated 6 years ago by zokes. I chopped down a small bush this weekend and took it to the tip in the car. Fast forward to Monday morning and I’m doing 70mph down the M60 when a big spider lowers itself from the ceiling of the car inches from my face, before vanishing into the footwell. Not good. Any bright ideas for killing any remaining spiders that could be in the car? I’m thinking of some sort of aerosol that I can spray under the seats and in the footwells. Or is there something that will lure them out? Stop being a big jesse! They aren’t poisonus or owt! My mate crashed a car when that happened to him . I told him to man up next time. It’s the spiders car now; make alternative travel arrangements. I thought ALL spiders were poisonous? Just to varying degrees. They get very protective of their cars, I think. That happened to the missus, when we were in Australia, and the spider in question was a Huntsman! No idea how she managed to avoid throwing herself from the moving van! Holy crap! I wouldn’t crash if that huntsman was in my car… just die of a heart attack! EDIT: I have no idea about the fatality statistics for Huntsmen themselves in this situation. I suspect they just toddle off out of the smashed up windows after the resultant pile-up. To the OP: just man up you big blouse. Spraying toxic chemicals around in an enclosed space will do far more harm than the spiders ever will. I knew there was a good reason I’d not emigrated to Oz yet. [pedant]Technically, spiders aren’t poisonous (i.e. you can eat them), they’re venomous. All spiders have venom, but can give a dry bite if they feel threatened. The other issue is that the smaller ones may not have fangs large enough to puncture human skin. Your common house spider if large enough can give you a slightly unpleasant nip. Wish I had a spider in my car, keeps the flies in check! We used to have a large spider in a works Transit that would throw out the empty fly carcasses once it was done with them and it would occasionally drop down when you were driving, very unsettling! Gave her quite a nasty nip by all accounts. Wish I had a spider in my car, keeps the flies in check! You need to find a place to bury the body soon. Did you get a good look at his face and was he smiling as he dropped in your lap? Spider + chemicals = it’s never going to end well!! I had a very similar problem after clearing a bush from the back garden, so I opened all the windows to blow stuff out, then I got a facefull of bush dirt as the wind was whipping around the car! I’d do the sunvisors first. Any bright ideas for killing the lizard that’s in the car? I’m thinking of some sort of aerosol that I can spray under the seats and in the footwells. Or is there something that will lure it out? 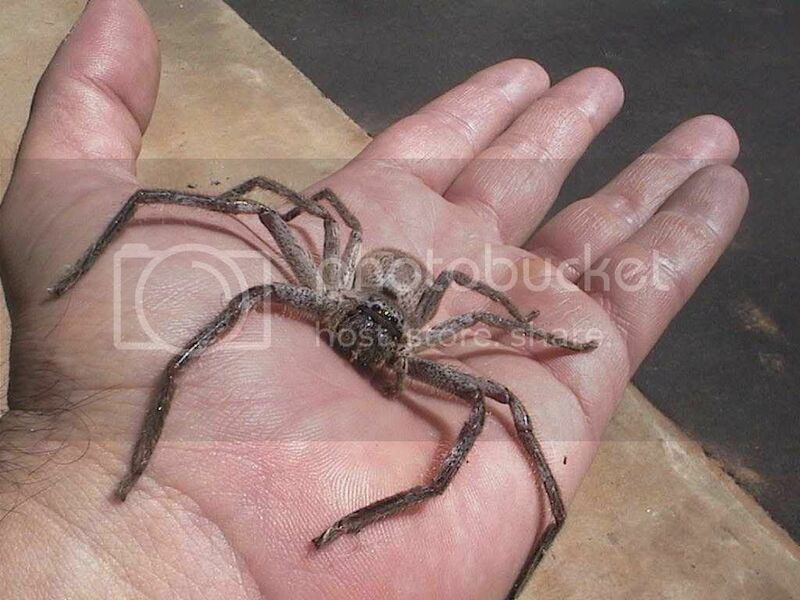 I have battled a huntsman w vacuum cleaner….they move sooo fast, especially when you are chasing at 6am, having woken up to find one in the bedroom! Its the funnel webs and red backs that you have to watch out for though – they will give a damn nasty bite and trip to the hospital! The topic ‘Spiders at 70mph’ is closed to new replies.